On the last Monday of every May, we observe Memorial Day to honor those who have given their lives in service to our country. In true American fashion, we've turned the long holiday weekend into a time to celebrate those men and women, often in the form of cookouts! Memorial day provides a feasting frenzy for any foodie, below we've picked some awesome recipes for an effortlessly delicious Memorial Day Menu. We've even listed the ideal drink pairing with the main dishes so you can take your party to the next level! One of these recipes look appetizing to you? Click the links below and start cooking! At almost every cookout I’ve attended, cheeseburgers have been a staple on the menu. It time we take this classic to the next level packed with Medmont Mercantile's flavorful Cajun Cocktail Sauce, Wisconsin Cheese and juicy caramelized onions! Click here for our adaptation on a recipe from one of our favorite cookbooks, Tout Hache: Meatballs, Tartares, Burgers, available at Wine Gourmet! What's memorial day without a full rack of ribs? The key to those perfect, fall-off the bone ribs comes from baking them before throwing them on the grill. 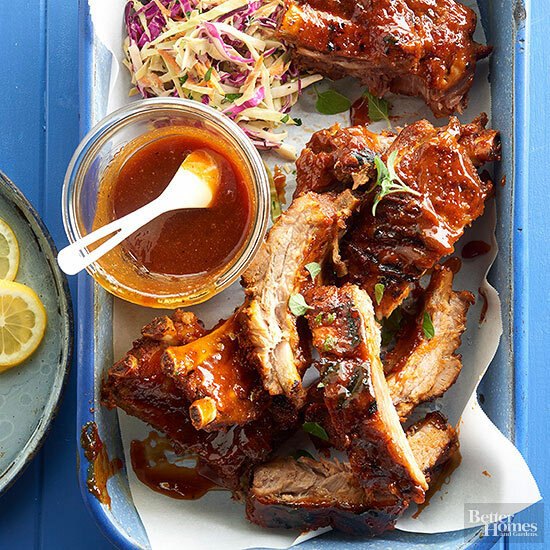 Slow and steady wins the race with these BBQ Baby Back Ribs! Finish off with a bottle of any of our three Medmont Mercantile BBQ Sauces for an irresistible dish! Click here for our adaptation of this recipe from Better Homes and Gardens! Preparing for several guests can be difficult, which is why we chose this easy make-ahead Shrimp Boil recipe drizzled with Boar and Castle Sauce for our menu! With virtually zero cleanup involved and a few simple steps, this is a must for large summer gatherings. Click here for our adaptation of this recipe from DAMN Delicious! These savory potatoes with an Edmond Fallot Dijon Mustard marinade are a crispy and delicious must-have side this summer! You can boil that potatoes and prep your marinade ahead of time to reserve precious cooking time the day of your event! Click here for our adaptation of this recipe from Once Upon a Chef! Cookouts are often synonymous with a side of pasta salad, but this year we're adding Medmont Mercantile Pickled Asparagus and Vineyard Pasta to this refreshing classic! Once you get a hint of that pickling brine from the asparagus, there's no turning back! Click here for our adaptation of this recipe from Real Simple! Grab-and-go food is essential to any cookout. Not only does it make things easier, but it keeps guests happy when they don't have to linger in front of your spread picking over what they want! Spice up your party with this twist on a classic antipasto tray and salad, both delicious and quick! This is the perfect opportunity to mix our Volpi Wine-Infused Salamis with any (or all!!) of our Medmont Mercantile Pickled Vegetables! Eat as is or dip in our of our gourmet dip mixes below or any of our Medmont Mercantile Salad Dressings! Click here for our adaptation of the recipe from ManTitlement! What’s a party without a delicious dip? Often making a simple dip can take far too long when we’ve got a monstrous list of other things to prepare. Try any of these four Too Good Gourmet Dip Mixes for an effortless menu addition. Choose from Artichoke, Sundried Tomato, Spinach, and Garlic Herb. Just add 1 cup of mayonnaise and 1 cup of sour cream or for a healthy option, you can add 2 cups of yogurt or low fat sour cream. Serve with Elki Sea Salt Crostinis or vegetables! Between the burgers and rubs, don't forget to break up the heavier menu items with something light and fresh! Fruit salad is the perfect refreshing side for every Memorial Day Party. Take it to the next level with a patriotic touch by using star cookie cutters to cut out watermelon and other fruits! Click here for our adaptation this recipe from A Family Feast! Every cookout needs an amazing dessert to top off the delicious feast, why not end it with a cocktail and pie all in one? This make-ahead Strawerry-rita pie is sure to be a hit with all of your guests. We've spiced it up with Medmont Mercantile Strawberry Margarita Mixer and Medmont Mercantile Strawberry Preserves! Click here for our adaptation of the recipe from one of our favorite dessert cookbooks, Southern Living's: Scooped!